In my role as Senior Content Creative at Big Spaceship, I ideate, create, and manage social media content and campaigns for YouTube TV and YouTube Red Originals. I write and post all content for the brands’ Twitter and Instagram platforms, optimizing pop culture relevance and social media behaviors. The Goal: Create a social bingo card for The Bachelor to help promote real-time conversation during the hometown date episode (if you’re not part of #BachelorNation this is like the Final Four of March Madness). My Role: I wrote 35 content options to fill spaces across 4 total boards, as well as live-tweeted the event and engaging with fans in real-time from the brand' account. The Goal: Create a spoof on Ryan Hansen’s resume to promote the YouTube Red Originals show Ryan Hansen Solves Crimes on Television*. 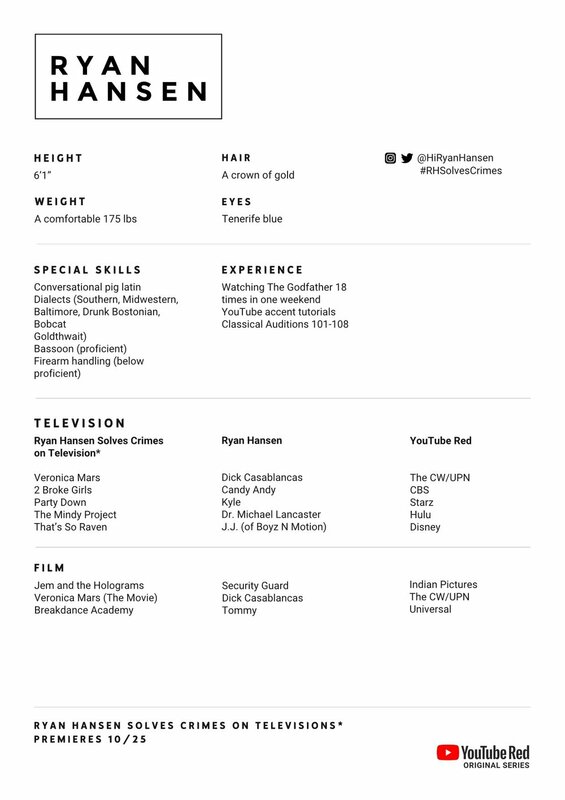 This resume was distributed at an exclusive premiere screening at Tribeca Film Festival. My Role: I researched, wrote, and edited the contents of the resume, harping on Hansen’s real experience and embellishing where necessary to match the exaggeration of his character from the show.